Jazz guitar virtuoso Joe Pass was one of the most sophisticated players to ever pick up the guitar. Pass’s fingers seemed to move up and down the neck playing single notes, walking bass lines, and chordal accompaniment all at the same time. One of the secrets behind Pass’s prowess was the CAGED System, which gave him the ability to visualize chord shapes up and down the guitar neck. If you’ve never heard of the CAGED system, you’re missing out. One of the best guitar hacks in the history of the guitar—the CAGED system provides a simple way to visualize the logic of the fretboard that works for beginners and virtuosos alike. While the keyboard of the piano is laid out in a linear fashion, the fretboard of the guitar seems somewhat more confusing. The confusion stems, in part, from the fact that it’s possible to play the same note several places on the fretboard. The “E” played on the open 1st string is the same pitch as the “E” on the 5th fret of the 2nd string, the “E” on the 7th fret of the 3rd string, and the “E” on the 14th fret of the 4th string, and so on. But while the guitar doesn’t have the linear logic of a piano, it still has a logical structure. Different methods have been dedicated to unlocking the logic of the fretboard, but the CAGED system is one of the most effective and efficient approaches because it lays out everything in an easy-to-grasp manner. The name stems from the five basic chord shapes that all beginner guitar players learn: C major, A major, G major, E major, and D major. Critics of the CAGED system feel that it overly simplifies the guitar. Music theory can be quite complicated, but theory is theory and music is music. Now I don’t mean to downplay the importance of theory, but rather to emphasize that the act of making music is what matters most. Jazz guitar, for instance, demands a firm foundation in music theory with it’s altered chords and scales, chord substitutions, key changes, and more—but even Jazz greats recommend not getting bogged down in complicated names and details, but keeping things simple and easy. The CAGED System is perfect in this regard. The first step in learning the CAGED System is to analyze the chords in the 1st position. The five basic chord shapes discussed earlier give you all the information you need to move up and down the fretboard. Folk and country singers often use a capo if they want to play in a different key by placing the capo at the appropriate location on the fretboard and playing the same chord shapes. If you place a capo on the 5th fret, the C shape becomes an F major chord, The E shape becomes an A major chord, and so on. The CAGED system utilizes that same logic. The trick to the CAGED system is to visualize the chord shapes without the capo. This is easily done by memorizing where the root note for each chord shape is located. The root of the E shape is the open 6th string. The open 5th string is the root of the A shape. The E and A shapes are the basic bar chords that form the backbone of rock and roll and are easy to move up and down the neck. The other three shapes work in exactly the same way. The root of the D shape is the open 4th string. The root of the G shape is the 3rd fret of the 6th string. The root for the C shape is the 3rd fret of the 5th string. The “a-ha” moment comes when you start to visualize how all of these chord shapes fit together, as you can see below. Once you memorize this pattern, you can play the same chord anywhere on the fretboard, using one of the five chord shapes we mentioned—which is an absolute game changer for your rhythm guitar playing. Then, once you’ve mastered the chord shapes, which itself can take some time, you can move on to memorizing the shapes of the underlying scales in each chordal position—and voilá, you know every note on the fretboard. Then you can just hone in on your ear for melody and your guitar phrasing, and you’ll be all set. OK, that sounds way easier than it is, but it’s well worth the time it takes to get there. The CAGED System has enormous benefits for all aspects of guitar playing. Its useful for understanding chord shapes, arpeggios, and scales up and down the neck of the guitar. Even though Pass played sophisticated jazz chords, he did think in terms of the basic chord shapes. (The majority of jazz chords such as C major 7, D minor 9, and G13 are all related to the basic chord shapes of the CAGED System). Pass’s solos and scales were based on these particular chord shapes, and as such, he could move effortlessly up and down the neck from one shape to the next. The CAGED System is certainly not the only method for learning the guitar. It is only one method, but it is one of the most logical and straightforward. It provides a simple way to unlock the logic of the fretboard and figure out the parts of the puzzle. 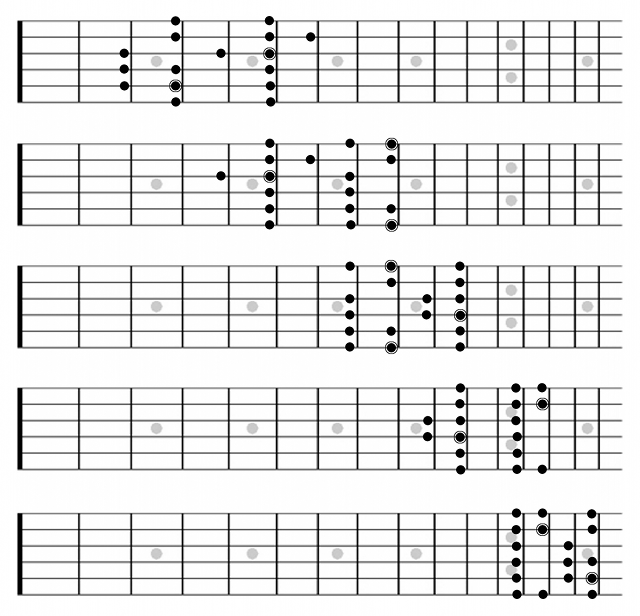 The five basic chord shapes serve as a visual map of the guitar and make it possible to find your way around on the fretboard in a relatively easy manner. But at the end of the day, remember that your ear should be doing the majority of the work—systems like this are only meant to provide a useful framework. As with all things in music, if it sounds good—it is good.